BLANK RADIO. A Milwaukee, WI based instrumental band. Founded on deep musical relationships and friendships lasting over the last decade. This duo brings an original, improvised, driving, experimental and jam vibe to a purely instrumental setting. BLANK RADIO... A Milwaukee, WI based instrumental band. Founded on deep musical relationships and friendships lasting over the last decade. This duo brings an original, improvised, driving, experimental and jam vibe to a purely instrumental setting. 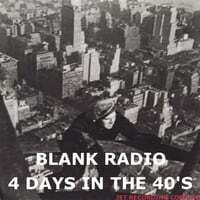 Blank Radio is equally led by its two members, Joey Carini and Dave Schoepke. 1970's and 1980's-era Miles Davis, Genesis, Jeff Beck, Sammy Davis Jr., Buddy Rich, a bunch of dudes that play steel drums on the beaches of warm places, Ravi Shankar and Bob Moog. Our influences and an unlimited amount of other sounds and songs. ALL SONGS ARE IMPROVISED.